Steve Goddard has a new post at WUWT in which he accuses the National Wildlife Federation of “stretching the truth.” It turns out he’s stretching things himself. Why 80 years? The relevant quantity is the trend now, not that over the last 80 years. The modern global warming era stars about 1975, not 1930, the trend is warming, and we expect that trend to continue. Such an analysis should examine the present trend, which suports the pattern which we expect to continue into the future. More interesting is the question, why 1930 specifically? After all the NCDC data he uses start in 1895, so there’s 115 years of data total, not 80. I looked at the data myself (portal here, data here). I originally planned to look at two states, Massachusetts and Maine (having lived in both), but what I found made it unnecessary to look further than Massachusetts. It seems that Goddard picked 1930 as his starting point because that gives him the result he wants. That’s called cherry-picking. Goddard has a history of cherry-picking. The only thing he’s proved is that if you want to deny global warming, you don’t just have to stretch the truth … you have to break it. This might actually be an improvement for Goddard, in that he’s calculating a trend. I think he sometimes used to just pick out a warm year in the 1930s in the US somewhere, and compare it, point to point, to the current temperature. Then he’d declare there is no warming, without a thought about what might have happened in between, or whether the relative warmth of the US in the 1930s is representative of global conditions. I see that you prefer to cherry-pick 1975 as the start date, because that gives you a nice trough-to-peak exaggeration. [Response: It’s easy to show that 1975 is a good estimate of when the global trend changed to its modern value. Demonstrably. There really is a difference which follows from rigorous statistical analysis — something you seem to know nothing about. It’s also easy to show that the modern trend is different from the “trend since 1930” — both for the U.S. and for the globe. Clearly you don’t really care about investigating the modern trend, you only care about cherry-picking the trend you like. Might also be fun to plot the rsq value over time. is capable of doing anything. You “expect” temperatures to warm, so you found a date which supports what you are expect to find. That is nonsense. Even worse, the date you picked is the bottom of a trough. The pre-1930 warming was nearly as great as the post-1975 warming. 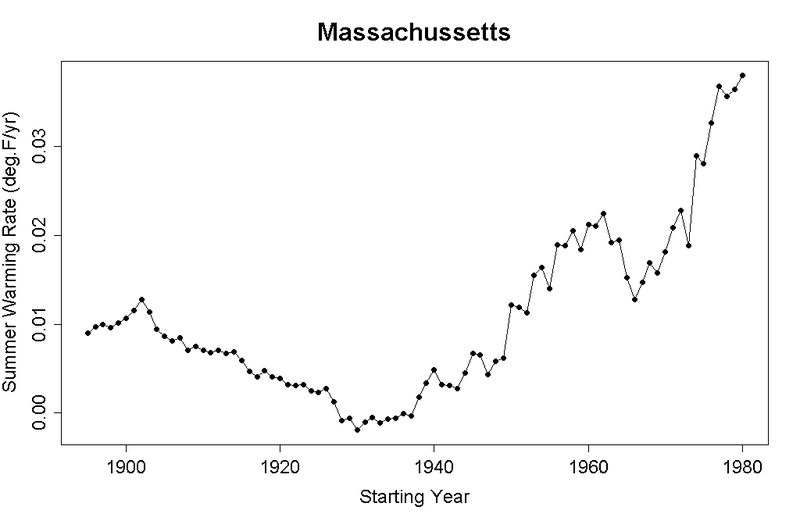 I chose 1930 because it provides a much more meaningful peak-to-peak comparison, and because it is a longer data set. Anyway, if Mann’s hockey stick was accurate, it wouldn’t make any difference what start date I chose. [Response: Are you really that clueless? Can you really not see how transparent this ruse is? Things get too hot for you so you decide to change the subject. And your cheap shot isn’t even correct. Your words are those of a true believer, not an open-minded scientist. 1) Projections of future warmth are not just based on extrapolating existing trends, they are based on understanding the underlying climatic factors (including increasing greenhouse gases). 2) He got burned once on drawing a trend line through Arctic ice and picking improper start and end dates for a cyclic parameter such that he got a misleading trend out of it. The lesson learned was “peak to peak” or “trough to trough”. Unfortunately, he failed to learn that this only applies to strongly cyclic processes (eg, annual trends of Arctic sea ice) and also ideally to multiple cycles, not just 1. Temperatures went up until 1930, down until 1970, up till 1998. Whether or not you chose to believe it, there are peaks and valleys in the graph. The NWF article was about the Atlantic coast and deep south states. That is what I responded to. [Response: The trend right now is up, both for the globe and for the Atlantic coast/deep south states. It’s not because of some cycle, it’s due to the laws of physics and atmospheric conditions which are only going to get worse in upcoming decades. The NWF article was correct to warn us that the continuation of this trend spells trouble for this region, just as it does for the globe as a whole. You are horribly wrong, and irresponsible, in your attempts to obstruct trying to do something about it. The SCIENCE says that temperatures did not rise from the mid-30s to the mid-70s because of sulfate aerosols in fossil fuels. And what happened in the mid-70s? Clean-air legislation, and more importantly the phasing out of sulfur-rich fuels. Care to actually address the science? Now what happened in 1930?…. Not much, really. That’s the most braindead thing I’ve read all day. Since Mann’s temperature reconstruction is well supported, we can stipulate the main conclusion is true: modern temperatures are very anomalous compared to historical temperatures. So, the further back we pick our start point, the lower the linear trend will be. This is plain. It is also plainly a stupid thing to do. Does our friend Steve think before he spouts off? I have yet to see evidence of it. Anyway, it’s nice that he’s posting in an environment where he can’t simply silence all the many people calling him on his shenanigans. That’s the best Steven Goddard can do? Resort to the schoolyard taunt, “I’m not a cherry picker, you are!” and follow it up with name-calling. Why am I not surprised? At first, looking at the figure, I thought S.G. “only” picked the point(/year) associated with the minimum value, i.e. the one leading to the largest negative trend …. then I looked at the y-axis scale: did he really choose one of the only very few points that would lead to a (relatively small) negative trend?!? Rigorously, Tamino should have checked all the states … but after such a result, I can’t blame him for not wanting to (very likely) waste his time. Tamino: I’m just a schmuck lawyer, but it seems to me that SG has a tiny fraction of a point. From your posts, you have taught me two things: 1) be careful to articulate your null hyp0thesis accurately and 2) climate signals need 30 years to appear. Now, it seems to me that the null hypothesis is that variations in summer weather trends are unforced, and, unless I’m misreading your graph, you did not calculate a 30-year running average. Don’t you need to do those things before arguing that SG is incorrect? Francis, please note also that Tamino computed trends for starting years in the range 1895-1980, but the ending year always 2010. Se every computed and plotted trend is over 30 years or more. For more brilliant Goddardian graphical analysis applied to wildlife, see here! So these magical cycles you’re referring to only act on that part of the world? Shorter Goddard: I know you are but what am I? Goddard is like one of those toys you give to a child that brings them endless hours of entertainment. Steven Goddard, why do you say temperatures went “up till 1998” and say that measuring from 1930 provides a “peak-to-peak comparison”? Wouldn’t you have to wait until temperatures stopped rising to determine the peak to which you want to compare 1930? In several of the states you examine there have been hotter years since 1998, and global temperatures have exceeded 1998 a couple of times since then. The last several months the global anomaly has been higher than ever. So I guess the most direct version of my question is: what is your system for categorizing something as a peak? What is the basis for this assertion? 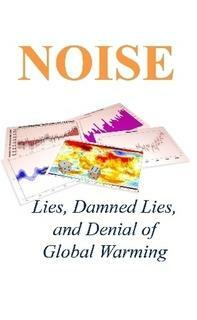 It sure sounds like cherry picking to anyone who’s heard about “proof” of global warming since the early 90’s. It sure wasn’t presented then as being a relatively new effect. Also, your denial of cycles seems to be particularly strident given that there are known influences on climate that wax and wane over time. While they may not have clearly defined periods, and you can play semantic games with the word “cycle”, how would you describe ENSO, AMO, NAO and PDO? There is no objective reason to choose 1975 as the starting point for a graph unless you can demonstrate that there was something that happened in that year that caused the specific effect that you’re measuring. [Response: Something did happen in 1975. The slope of the global temperature trend changed. That’s just a fact, and comes from proper statistical analysis of the data. And that’s an “objective reason” to choose 1975. You seem to have a subjective reason to dispute it: the truth makes you uncomfortable. I can’t tell you how giddy I was when I looked over at the Recent Comments side of the page and saw that Steve “Pickin’ cherries and countin’ pixels” Goddard decided to leave a few comments here. Steve, don’t be a stranger. Anytime you feel like coming over to be Tamino’s chew toy, please do. And while you’re here, would you mind explaining how you decide to take SST anomalies between -0.5 C and +0.5 C and set them equal to zero, but take an ever-so-slight cooling trend from your cherry-picked 1930 starting point and declare that significant enough to differentiate it from zero? There’s ambiguous wording in my last sentence in that first paragraph: “The last several months the global anomaly has been higher than ever.” That is not to say that *each* month’s anomaly has been higher than ever, I realize that this would only be possible with monotonic month-to-month increase in anomalies, and that’s obviously not happening. But look at the GISS land+ocean data and average several recent months together, and you’ll get a very large anomaly. I get +.66C anomaly for the last 12 months, which is bigger than any calendar year in the record. Look at UAH AMSU temperatures for the near-surface layer, and you see that very nearly every day in 2010 has been hotter than the same date in any other year since the beginning of the displayed data in August 1998. (you can also see in the UAH near-surface layer that several subsequent years were warmer than 1998 in the period for which 1998 data is displayed). So again, I’m curious how Mr. Goddard defines a “peak,” since it appears to me that temperatures are still headed upwards. Even if there were a repeating waveform on the relevant time frame, if comparing peak to trough is a no-no, then comparing peak to mid-cycle is also a no-no, right? [Response: It’s even worse when the supposed cycle is a figment of the imagination. I get +.66C anomaly for the last 12 months, which is bigger than any calendar year in the record. Look at UAH AMSU temperatures for the near-surface layer, and you see that very nearly every day in 2010 has been hotter than the same date in any other year since the beginning of the displayed data in August 1998. The NASA GISS 12-month global land and ocean average temperature anomalies ending in March, April and May were 63.58, 65.67 and 66.33 each set a new the world record — for the instumental period. However, one may naturally ask what previous 12-month averages are statistically tied with May of 2010. Given this, the previous 12-month periods that are statistically tied are those ending in October through December of 2005 (61.58, 61.42, 62.17), May, July and August of 2007 (61.33, 62.08, 61.67) and the twelve month period ending in March and April of 2010 (63.58, 65.67), and April of 2010 is the first that we set a new record that was not statistically tied with September of 1998 which came in at 58.67. However, one may also ask why I am using NASA GISS rather than Hadley CRU. NASA GISS would appear to be more accurate as it takes into account much of the warming that Hadley CRU omits. One major source of differences is the fact that the GISS method extrapolates temperature anomalies to all areas that have at least one station located within 1,200 km, using weights for these stations that decrease linearly with distance from the station. This warming would appear to be primarily in the Arctic and Antarctic. … the main difference between ][NASA GISS and Hadley CRU] analyses is probably due to the fact that British analysis excludes large areas in the Arctic and Antarctic where observations are sparse. The GISS analysis, which extrapolates temperature anomalies as far as 1200 km, has more complete coverage of the polar areas. The extrapolation introduces uncertainty, but there is independent information, including satellite infrared measurements and reduced Arctic sea ice cover, which supports the existence of substantial positive temperature anomalies in those regions. … and after careful analysis, the European Centre for Medium-Range Weather Forecasts concurs – as is reported by the UK’s Met Office. New analysis released today has shown the global temperature rise calculated by the Met Office’s HadCRUT record is at the lower end of likely warming. The study, carried out by ECMWF (the European Centre for Medium-Range Weather Forecasts) with input from the Met Office, performs a new calculation of global temperature rise. This independent analysis is based on information from a wide range of sources. It uses all available surface temperature measurements, together with data from sources such as satellites, radiosondes, ships and buoys. JohnH: Nobody is denying that effects such as ENSO and the rest are real and go up and down. Have you wondered what the “O” stands for? It’s “oscillation” – a far better term than cycle, since these effects have no clear period (not a simple oscillator, of course). And, being oscillations, they go up, and they go down – hence they really aren’t interesting when looking at trends. If you want to study ENSO, you can detrend temperature data and look at the wiggles up close. If you want to look at long term temperature change, you can treat ENSO as noise in the system. When speaking of choosing 1975 as a turning point, you said “It sure wasn’t presented then as being a relatively new effect.” Wow. At least you are consistent in your mistakes – most deniers aren’t. But in the 80s, there was insufficient data to conclusively claim a turning point around 1975. That’s not when global warming started, though. Don’t go tilting at that particular straw man. Wow, nice to see Mr “Goddard” show up for once. It was a surprise for sure. Not that it really matters, though, because it’s all just deliberate smoke and mirrors, and you can’t defend that. Note how obvious it is that Steve’s graphs should (excepting maybe Vermont and Maine) be shown drawn DOWNWARDS, to a 1975 breakpoint. And that afterwards they would all have an UPWARDS slope. Do note in what decades the AMO changed direction. Thanks Tamino. The disconnect between the GISS monthly averages and UAH’s daily surface-level data was confusing to me, but I don’t have enough of a knowledge base to judge when data doesn’t seem credible. Is Mr Goddard going over to Science of Doom next to correct him on his views about why Venus is hot? Of course, ENSO, AMO and Sun are at play – but altogether they don’t explain the warming. Please see http://sites.google.com/site/refsdefred/warming-actors to see how they influence global warming. I’d love to see some deniers explain us (next February, after some big rains) that Lake Mead levels (http://www.arachnoid.com/NaturalResources/index.html) are recovering ! Goddard replies. with another cherry pick. It’s like trying to argue with someone about the shape of the Earth. You point to all the reasons it’s known to be round, and he counters with a globe and claims victory, “See, it’s flat, like I said!”. I’ve read both sides of this and I still don’t get the reason why 1975 is a reasonable starting point. I’m no statistician or scientist, but it does seem like the climate is cyclical to some degree just from looking at temperature charts both long and short term, and would therefore suggest that a peak-peak, or trough-trough approach would be more convincing. What is there to suggest that the climate is not cyclical. The area which I have experience in this type of thing is the stock market (which I think is somewhat similar, at least in its characteristics as a complex system where there are huge numbers of unknown variables and interactions that determine the outcome) and in that case, looking at the most recent trend only would almost certainly cause one to overshoot in predicting the rate of change, even if the guess at the overall directional movement (secular trend, in trader speak) is correctly guessed, simply because of periodi reversals. Please let me know if/why I am wrong. [Response: Your last paragraph (in parentheses) is playground-style ad hominem crap — masquerading as an appeal to avoid it. tho, let me make this very simple. Is there any system more complicated than the human body? No? Well then. What do you think will happen if you drive your car into a brick wall at 50 mi/h? Unpredictable? Sure, not even the best doctor in the world will be able to accurately predict which bones will snap. But even Forrest Gump can tell you it’s an experience better avoided. Up and down does not equal cyclic. There are many physical systems that oscillate, and some do so even quasi-periodically. That does not mean they are actually cyclic. Looking “by eye” is a recipe for fooling yourself, as our brains are machines tuned to look for order, and they find it even when it is not there. As to the rest of what you post, you can show that 1975 is a turning point. Fit to a single slope. Now fit to two slopes and leave the breakpoint as a parameter to be determined by the data. You will get a breakpoint about 1975, AND you can show that the two line solution gives a statistically signgificantly better fit than the single using AIC or related parameters. Point conceded on cyclicality, I don’t have strong evidence for it other than the “looks like it” test. I do know of the 11 year cycle in solar output, but also that it is too small to be very relevant to the present trend, and the longer term cycles in the earth’s orbital geometry, but that it seems to be too long term to be relevant to the current, rapid trend. On the unknown variables aspect, though, I strongly disagree, and I am actually surprised that there is disagreement here. My point was really just supposed to be about cyclicality. I took the unknowns as a given. The energy in/out system that you mention is as obvious as it is simple, so is the stock market (to draw that parallel again). Buyers enter the market for any given security, prices rise. Sellers enter, price drops. This is obviously the driver for price movements in the market, but the question is what will draw the buyers/sellers in and to what degree. So for climate the ultimate temperature driver is clear, but the variables that drive the amount of energy in (I assume this is just the sun here) and energy out are what is in question. For the energy out it is known that one of the variables is CO2, but if it were that simple we would be able to predict the climate with ease, continuously rising as a function of CO2 concentrations. But we can’t. [Response: Not only can we predict the long-term trend in global temperature, it was predicted before it was observed, and it has been continuously rising since at least 1975. The unknowns provide too much interference, and it’s important to recognize that. This is why I though of the markets as a good comparison. Any trader has to understand that the unknowns are out there. In fact there was a hedge fund (I forget the name) that attributed a massive loss in 2008 to a 35 std deviation event. This made me laugh, as there is really no such thing as a 35 sigma event, and it was obviously just their model that was lacking, but they wouldn’t admit it. The presence of unknowns must be recognized in any system not fully understood. They are not just a distraction, research is needed to uncover the unknowns and models must be improved as they are discovered. Isn’t that what science is all about after all? [Response: Who doesn’t want to reduce uncertainty? What’s unscientific is to use uncertainty as an excuse to disregard truth. You’re emulating the tobacco company shills who emphasized the vastness of the uncertainty in how tobacco smoke affects the user, in the mechanisms and details of how cancer begins and progresses in the human body. It’s so complicated! Nobody really understands it all!! There are too many unknown factors!!! We also heard that story from their paid “scientists” — many of whom are exactly the same scientists who now dispute the reality and/or danger of global warming. In retrospect we all know that in spite of the astounding, amazing, mind-boggling, billions-upon-billions-of-unknown-variables, incomprehensible complexity of the human body — tobacco smoke is still carcinogenic. Plain and simple. The stock market? Oh dear. What makes you think the stock market is predictable? People have been trying all sorts of voodoo statistics masquerading as science for decades, and they still can’t do very well. Climate, though, is a physical system, and isn’t dependant on the whim of antsy investors. Yes, it’s complicated, but that doesn’t mean we can’t understand it very well indeed. On the other hand, you do have half a point. If we were just looking at the temperature chart in isolation, we wouldn’t be able to tell much from it. Yes, there is a trend, but where is it going and why? That’s why we *don’t* look at the temperature graph in isolation. Instead, we rely on physics, and hundreds of studies that all conclude the same thing. Think of it like this: imagine you are tracking a single stock. The company makes widgets. You know for certain that there will be a massive demand for widgets in the near future. It doesn’t take a stockbroker to work out that the company is going to be doing well. BTW – I know that you can download some of the GISS code and data, and somebody checked it out and said that they couldn’t find any problems with it. No need to post that again. “BTW, I know everything I’m saying can’t be proven and has no basis whatsoever, so there’s no need to tell me and let other people find out”. From comments recently posted there, Mr. Cherry is gone from WUWT. This comes in a posting from Mr. Watts that has the sad news that due to a family medical emergency he will be largely gone from his blog for months. No matter what one thinks about his science and politics, I think we can all wish him and his family a well at this time. Mr. Watts was appealing for moderation help in the same posting – I have this feeling that he wasn’t comfortable allowing Mr. Cherry to run the show.